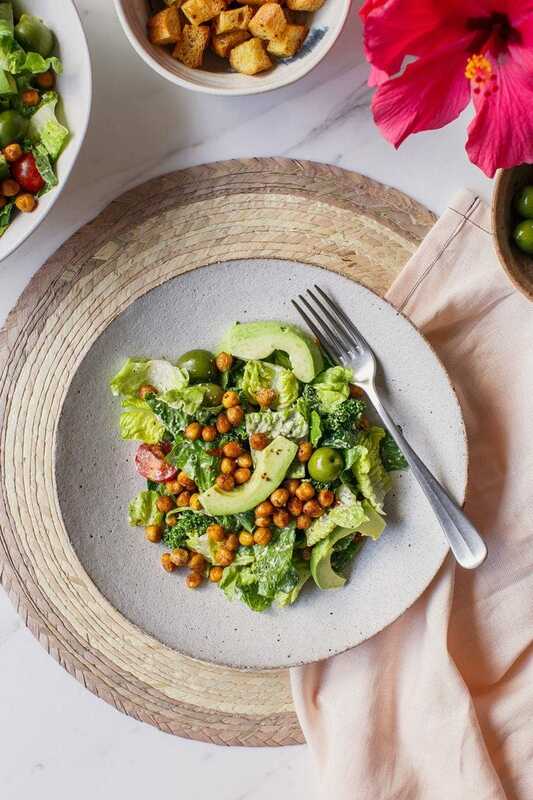 Done in 20 minutes – this creamy, tangy Vegan Caesar Salad is delicious topped with crispy chickpea croutons, straight out of the oven. The dairy free dressing is a blend of macadamia nuts, extra virgin olive oil, Dijon mustard and garlic. 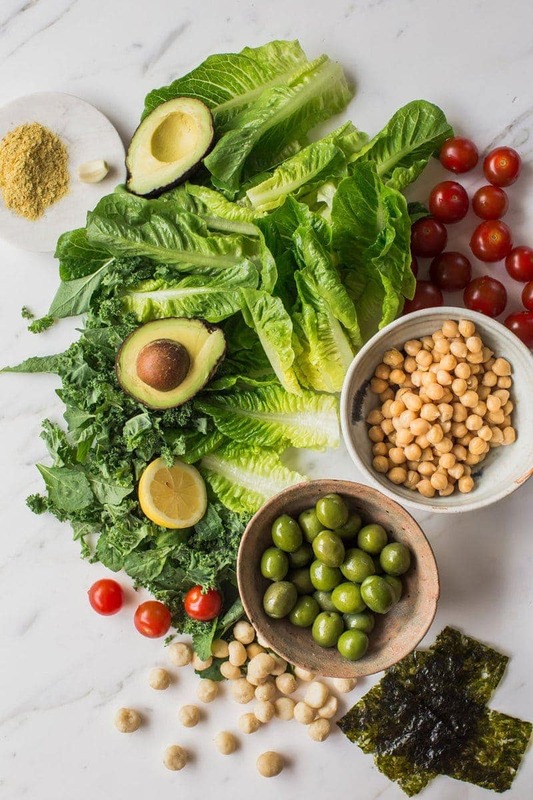 The classic Caesar salad is actually pretty easy to vegan-ise, and even easier to make. 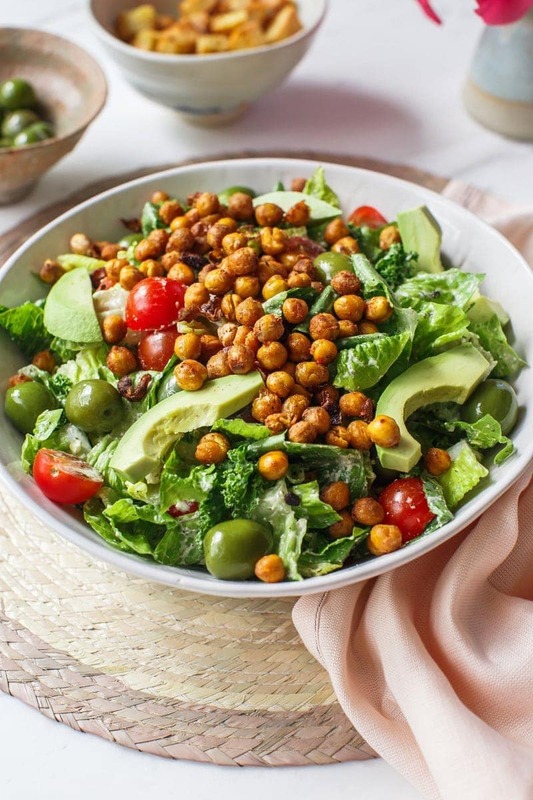 The creamy dressing is what brings it all together, and the addition of crispy chickpeas as ‘croutons’ makes it suitable for those avoiding gluten. The salad base is a mix of cos lettuce with just a little baby kale – adding some bitterness which I like more for its health benefits than taste (obvs!). Bitter greens stimulate production of gastric juices and for the most part out diet is lacking since our fruits and vegetables have been hybridised to make them sweet and palatable. Sigh. I’ve added big juicy Sicilian green olives for a little umami flavour, some cherry tomatoes and ripe avocado. The dressing is entirely dairy free, and whipped up in 30 seconds flat. I chose macadamia nuts as they have a milder flavour than cashews, and, because they are so soft and buttery, they don’t need to be soaked to soften in advance of blending. In place of anchovies, I’ve used a little toasted nori – as in the wrappers you use for making sushi. A little goes a long way, but it lends a salty-sea flavour without the fish. Genius. 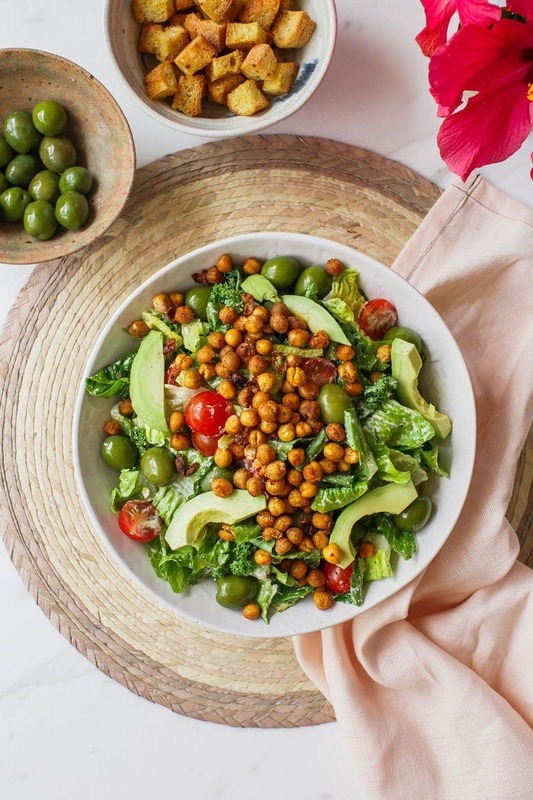 The dressing also contains a little Dijon mustard, nutritional yeast (which is a little cheesy tasting and full of B group vitamins), garlic and olive oil. As for the croutons, I know you’re going ask – are the chickpeas really crispy?! To be honest I fear the homemade crispy chickpeas thing may be a bit of a myth. In saying that, I think I have found a way to make them somewhat crunchier – definitely not soft anyway. The trick to crispy chickpeas is to dry them as well as you can before baking. To do this, you place them in the centre of a clean tea towel, then fold the sides over and give them a good rub. I’ve read one recipe that calls for peeling off all the outer layers – erm, no thanks, that seems far too laborious! From here you toss in olive oil and spices, then bake till they start to pop. They’re yum, and close enough texture wise – just enjoy them straight away. That’s all from me today friends, thanks for reading, enjoy the recipe, and see you next week! 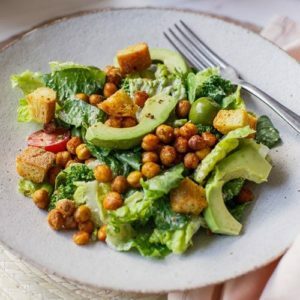 Vegan Caesar Salad with a creamy, tangy dressing and crispy chickpea croutons. Serves 2-4 depending on whether you enjoy as a main or a side. 1 teaspoon onion powder not onion salt! First, get the croutons on to cook. Drain and rinse the chickpeas, then rub dry in a clean tea towel. Toss them with the rest of the ingredients to coat and bake at 175˚C (347˚F) for 15 minutes or until they start to pop, tossing frequently. To make the dressing, blend all ingredients on high till creamy. Wash the greens and spin them dry, then cut the cos into 1 inch strips and the kale into smaller ribbons. Add to large bowl with the halved cherry tomatoes, then pour the dressing over and massage in with your hands. 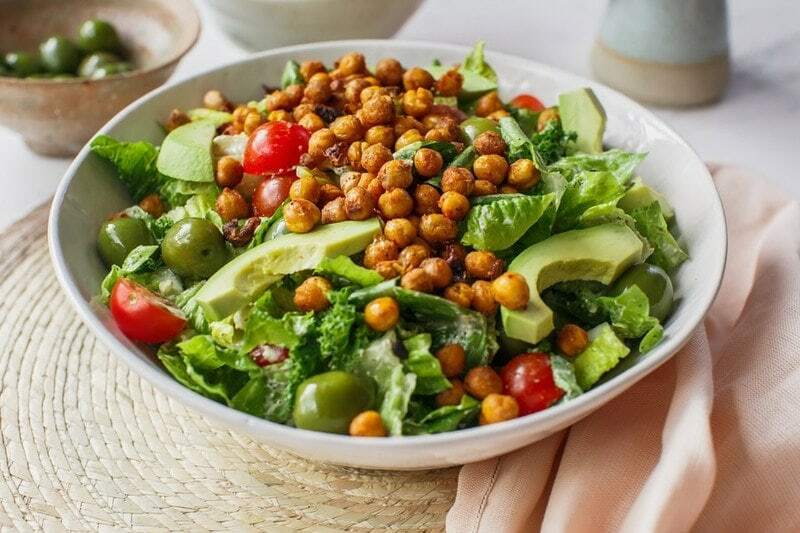 Add sliced avocado, olives and cooked chickpea croutons, serve and enjoy! You might like to add some good old garlic croutons in here – I prefer to use a gluten free bread, but my partner can’t go past sourdough. Just toss in olive oil and minced garlic, and bake till golden. I used a blend of cos lettuce with a little baby kale. Remember – the dryer your chickpeas are before baking, the crispier they will turn out!